Greetings from all of us at MGVS, and a very Happy New Year 2015! Thank you so much for your help and prayers throughout 2013 and 2014 that enabled us to serve remote communities of the Himalayas of North India. We are sorry we were not able to catch up with you last year about the work of MGVS. It is a joy to finally have this opportunity once again to share with you the progress of our ongoing efforts here in Garhwal. 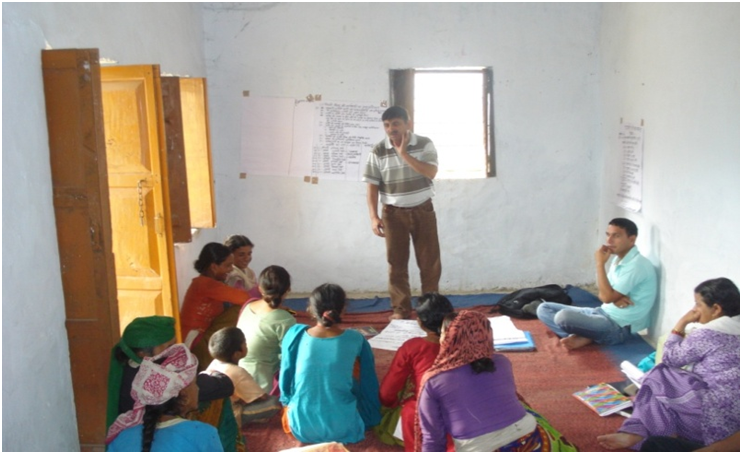 In May of 2013, MGVS funding partner: TEAR Australia formally evaluated the first three years of the MGVS Sustainable Development Project in Naugun Patti, District: Tehri Garhwal. The in-depth evaluation report appreciated the work of MGVS and the strong relationships our team has fostered with the 710 families of 14 villages of the area since 2010. During the current second phase of the project, MGVS then took on the new approach to development known as Outcome Mapping (OM). We were eager to try out the OM model because we felt it fit with the MGVS approach, which has been holistic, since our NGO’s inception in 1981. And that it would help us further promote a culture of justice in the area. We hope you will enjoy reading about some of the highlights of our work under this exciting and innovative approach, below. MGVS Kaplani High School and MGVS Donk Primary School have both completed another two years of positive growth as well, with your amazing help. We are especially happy to inform you that in December of 2013, Kaplani School was granted Permanent Government Recognition from the State Education Department of Uttarakhand for Grades Nine and Ten! We had been working toward this goal since 2009. Please read on to learn how this change, and others, have improved the lives of many students and their families in the Kaplani and Suwakholi areas. Thank you so much for your continued and invaluable support. For joining us in this effort to improve life for marginalized people living in remote areas of Garhwal. We invite you to visit us and our projects here in India. Please feel free to write to our office as well, at mgvs1@vsnl.com, or at the postal address below. On November 13th, 2014, an inter-school debate on gender issues was held in Gaer Village at the Gaer Government High School. District Panchayat Member: Mr. Chaman Prasad, Pradhan of Gaer Village: Mr. Harish Raturi, Pradhan of Village Kyarda: Mrs. Asha Devi and President of the School Management Committee for the area: Mr. Rakesh Notiyal attended. And MGVS funding partner, TEAR Australia’s Program Officer for India: Ms. Thien Nga Nguyen, was warmly welcomed by these local leaders to this event as well, as the Guest of Honour. Nine Students (4 boys and 5 girls) from the two high schools and one inter college of the Naugun Valley area participated in the competition (an inter college provides education up to Class 12). The debate provided an opportunity to the adolescent boys and girls of Naugun Patti to express their views on equal rights for girls and women with their teachers and their peers in a formal setting. This debate follows the Women Empowerment Mela, held in 2012, as the first inter-school discussion on this sensitive issue of gender roles in this remote valley. It is part of the MGVS Gender Sensitization program, which has been providing training to both adolescent students of the area, at school, as well as 4 men’s and 13 women’s Self Help Groups since 2010. A common theme among the speeches made by girls was the injustice which starts as early as a girl begins school: that she is expected to do chores while a boy is allowed to play after school. That even if she finds time to attend school and study that she may not be allowed to study beyond Class 12. But that her brother will be encouraged to go on to achieve a B.A. Gaer High School, Class Ten student, Kavita Notiyal, was awarded first prize. Prizes were awarded for first, second and third places, and appreciation prizes were awarded to the other six students who spoke as well. MGVS organized the event, provided the prizes and refreshments to all. The principal and the teachers of Gaer High School contributed to the event too, by putting up a tent, preparing the stage and the seating arrangements. The Koliyana Women’s Self Help Group was established on April 3rd, 2014 by ten women with a strong belief that they could do more to improve their economic status as a group. Koliyana is a settlement of “lower-caste” poor families living on the outskirts of the Kyarda Panchayat. The women deposited Rs. 500/- each as a first instalment and agreed to deposit Rs. 50/- every month. MGVS matched their initial deposits with a total of Rs. 1000/- and with some further guidance, the group now runs an effective savings and loan society. Presently the group has lent Rs. 6000/- out to its members @24% interest, which has helped members pay off debts to moneylenders borrowed @120% interest. After much discussion and planning, MGVS helped this group start a Community Goatry Income Generation Project with 12 goats @Rs. 40,000/- on November 26th, 2014. MGVS Social Health Worker, Manju Singh, leading a discussion on balanced diets for 20 mothers at a Mother Child Festival in Vikol Village; she is assisted by [left to right] ANM: Jyoti Bala, Pradhan: Surender Lal and PHC Doctor: Dharmendra Uniyal, NRHM Supervisor: Subhash Ramola [second from right] and TEAR Australia Program Officer for India: Ms. Nga Nguyen [right] – 12/Nov/2014. Three Mother Child Festivals were held in the Naugun Valley in 2014. MGVS organized these festivals together with the pradhans of the Ghoan, Jamni and Vikol Panchayats to encourage the local village councils of the area to take an active part in improving the health status of their communities. The first festival took place on September 3rd, 2014, at the Ghoan ANM Centre in Pipalsari. ASHA (Accredited Social Health Activist) – Bundi Devi, ANM (Antenatal Nurse Midwife) – Savita Notiyal and Kandisaur PHC (Public Health Centre) Medical Supervisor – Lalchand Yadav, and 2 Anganbadi (preschool) Teachers: Anita Devi and Vimla Devi, were all present to assist 30 mothers and 30 children throughout the festival. Children were vaccinated. Discussions on nutrition took place and demonstrations on how to make healthy foods for a balanced diet within minimum resources were held for all to see. Kichiri (a mixed dish with rice, pulses oil etc.) was prepared. Height and weight were measured for each child and prizes awarded to children under five who have completed their vaccination programs and showed improvement in weight. Hygiene talks using charts and pictures were followed by question and answer sessions. Two other festivals were held in a similar manner on September 24th, 2014, at the ANM Centre in Naag Raja Dhaar for 32 mothers and 30 children, and on November 12th, 2014 in the Vikol Panchayat Bhawan for 20 mothers & 35 children. MGVS has been systematically working toward building an effective health network between the midwives, govt. nurses, mothers, pre-school teachers, the ASHA health workers, the PHC in Chaam and the single doctor who works there: Dr. Dharmendra Uniyal, since 2010. And a doctor has now visited Naugun Patti, for the first time, when Dr. Uniyal participated in the Mother Child Festival in Vikol Village on November 12th, 2014. He reassured the women at the festival about the safety of hospital deliveries and that the PHC is ready to help them. Dr. Uniyal and NRHM (National Rural Health Mission) Supervisor, Subhash Ramola, who was also present for this event, explained how government schemes can be accessed, to the mothers and women present. MGVS aims to continue to build relations between the PHC and health workers of the area. MGVS collaborated with the Primary Health Centre in Chaam to organize a training workshop on how to improve the health status of the Naugun Valley. The workshop was held in the PHC at Chaam itself, on the 15th and 16th of November, 2013: 21 dais (midwives), 15 Anganbadi (preschool) Teachers and 7 village ASHA workers attended. The training focused on connecting mothers, midwives, and village ASHA workers with their Govt. ANM and the PHC in Chaam. And on how to effectively provide all with easy access to information related to health concerns and government schemes. The PHC doctor, Dr. Dharmendra Uniyal, was the main resource person for the training. He was assisted by NRHM (National Rural Health Mission) Mr. Subhash Ramola and Mr. Mukesh Negi, and PHC ANM: Mrs. Rajni Ramola of Chaam. The workshop focused on nutrition, vaccinations, superstitions, hospital deliveries, hygiene and HIV/AIDS/STDs. The MGVS team was present for the duration of the workshop and helped with all necessary arrangements, including preparation of information charts and other training materials. This two-day interaction encouraged new thinking, behaviours and relationships among all who participated. This was the first time Naugun Patti Anganbadi Teachers, village ASHA workers and midwives had an opportunity to interact with the doctor in Chaam directly and openly. A good understanding was also further established between the PHC doctor and other workers and the MGVS Team – they agreed their objectives are the same. That together, improving the health status of the area was possible. A follow-up of the training was held with 14 Anganbadi Teachers of Naugun Patti on August 28th, 2014 and Dr. Uniyal at the PHC in Chaam. Q&A and discussions on the following topics made up the review: balanced diets, breastfeeding, necessary immunizations, govt. health schemes updates, how to maintain an effective working relationship between Anganbadi Teacher, ASHA and ANM, and how to measure height and weight properly. This follow-up was held with Anganbadi Teachers as they play a key role in monitoring the health of children aged 3-5 yrs: they see these children regularly. MGVS provided each Anganbadi Teacher with a weighing machine at the close of the workshop. MGVS continues to visit with Anganbadi Teachers of the area for further individual follow-ups on the two workshops in November 2013 and August 2014. In May 2013, MGVS moved from being an organization focused on achieving outputs (results) to one that achieves outputs only if they bring us closer to changes in behaviour, attitudes and relationships. This is challenging but one of the major benefits of this new focus is that sustainability is built into this approach that promotes a culture of justice. MGVS has learned behaviour change becomes sustainable for a community when it is supported by new ways of thinking (attitudes), different ways of relating to people, and new networks. For example, the disability program MGVS has been implementing in Naugun Patti may continue to make change long after our team moves on to another area, if disabled individuals do really value themselves and look at life with hope. If their families look for opportunities for their disabled family member’s growth and well-being. If communities feel enriched when they see disabled community members moving around on pathways the community has specially built for them, rather than accepting disabled persons are to be quietly hidden away in village homes. We believe that when relationships between individuals, their families, their communities, which include the Panchayat (local councils), the Block Office and perhaps outside NGOs and government organizations, develop, that it becomes easier to support a new culture. And that those same attitudes of shame and discrimination may even fade as a community working for richer lives through inclusion of the marginalized becomes sustainable as a whole. This is why MGVS has now modeled our project around the Outcome Mapping approach to sustainable development, (first established by the IRDC in Canada). The vision our current efforts aim to promote in the Naugun Valley is: Transformation in how individuals, groups and organisations think, act and relate in Naugun Patti bringing human well being, justice, inclusion of the most vulnerable, and diverse opportunities for everyone to realize their potential. An understanding of the human-environment connection and practical skills in protecting and enriching both will be part of the new culture. We are extremely happy to inform you that MGVS field work, which was always holistic, has accelerated under this approach. Outcome Mapping has encouraged our team to work with anyone interested in the development of remote Naugun Patti, from the youth and the most marginalized in the Naugun valley itself, to Block Office representatives who are often removed from the happenings of their own people. MGVS organized a meeting with the newly elected (June 2014) representatives of the Naugun Patti village councils, on August 14th, 2014 at Inter College Naag Raja Dhaar. Ten Panchayat representatives attended: 4 pradhans (village council chiefs) and 6 ward members. The purpose of this very special meeting was to establish a friendly relation- ship with these key players in the development of the area, as most government schemes come to villager families through their respective Panchayat and pradhan. The MGVS Team congratulated the new leaders and representatives and shared the new MGVS Vision and Mission with them. MGVS Coordinator, Surender Singh, explained MGVS’s sustainable development strategies for 2013-2016 and assured the Panchayat members that MGVS was here to help. Not to criticize their work. That together MGVS and the Panchayats can make a difference. The meeting was a success, with much discussion. The Jamni pradhan, Surender was keen to start a new sewing and knitting centre in Jamni Village for women and girls. The BDC (Block Development Committee) Member of Kyarda Village expressed a wish to develop the forest. Others suggested working with progressive farmers and exposure visits to introduce newer farming techniques. Tea and refreshments concluded the meeting. In December 2013, Kaplani School became a fully government-recognized school under the Uttarakhand Government Education Department. This means Kaplani School students no longer need to be registered with other government schools. And we can provide our students with transfer certificates when they leave Kaplani School. As a direct result of government recognition the number of students has increased from 60 to 71 (29 girls and 42 boys) for the 2014-2015 school session. A total of 60 students (30 girls and 30 boys) have passed their Tenth Grade examinations through MGVS Kaplani High School since 2008: 28 graduates (12 girls and 16 boys) are completing their B.A./B.Sc. degrees and are enrolled in professional training programs, and 12 of these graduates (9 girls and 3 boys) are receiving financial help for their continued education. The Mid-Day Meal (rice and daal) continues to be served at both Kaplani High School and Donk Primary School. Which has resulted in a great increase in attendance. Healthy teeth are also now part of the MGVS Donk Primary School experience after SAPHARA of Northern Ireland organized a dental educatiion visit at Donk Primary School in February, 2014. And this year, remote Donk Primary School celebrated Christmas for the first time with a Christmas tree!